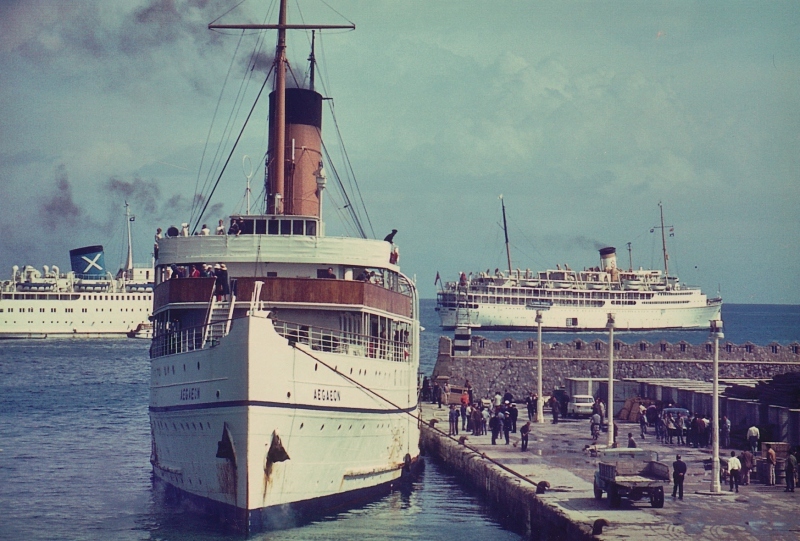 Truly a vintage shot; The Typaldos Line Aegaeon with Chandris Cruises Fiesta and Turkish Maritime Lines Ankara in the background. I believe this to be Rhodes. The photo was taken by the late Don Stoltenberg and reproduced with permission. I remember seeing the ANKARA in Lisbon cruising in the early 1970s. Her sistership was the CITY OF LISBON ex-SHAWNEE, Panama flag but Portuguese owned, sold to Yugoslavia.Great image, Clive. Yes Alexandros, that was a very silly mistake that I made. The Fiesta was quite a different ship. Thank you for the correction. I would like to correct mr Harvey on the Chandris Fiesta. It is another Chandris ship, Fantasia, ex Duke of York pictured on the left side of the photo. I should also mention that I think it is great that Mr Stoltenbergs photo can now be shared via another enthusiast, with permission. a feast for the eyes, this old CPR former princess is! mr.dot. Clive, another gem from your collection.